Everyday objects pushed to their perceptual limits characterize the dynamic and optically-challenging work of Robert Lazzarini. 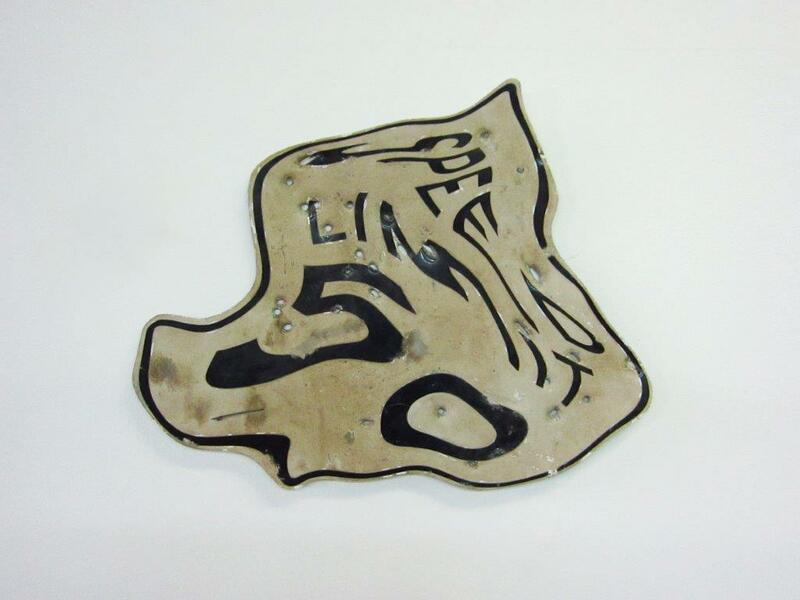 Here, a speed limit sign riddled with bullet holes melts, morphs, and stretches into a distorted shape. Lazzarini’s transformation of the sign plays with our cognitive ability to recognize (and ignore) the everyday object and also our material understanding of the rigid metal plane that is suddenly fluid. Lazzarini lives and works in New York. He has shown both nationally and internationally in group exhibitions at Yautepec, Mexico City; Haunch of Venison, New York; Tsinghua University Museum, Beijing; and FLAG Art Foundation, New York. His work is part of the public collections of The Carnegie Museum of Art, Pittsburgh; The Hirshhorn Museum and Sculpture Garden, Washington, D.C.; and the Whitney Museum of American Art, New York. In 2011, he was the subject of a FOCUS show at the Modern Art Museum of Fort Worth.